I got this watch as a present for my girlfriend's son for his birthday. When I received and opened the box I was surprised to see how elegant this watch was. I was in hope that he would like it just as much as I did when I have received it. He didn't disappoint me when he opened the box and jumped up from the joy to receive this watch. I would recommend this watch to day and night. This luxurious Akribos XXIV timepiece features a 44mm case with a polished bezel. The central dial is decorated with a stamped texturized pattern, and the outer dial is home to hand-applied Roman numeral markers. An alligator embossed genuine leather strap completes its opulent presence on the wrist. 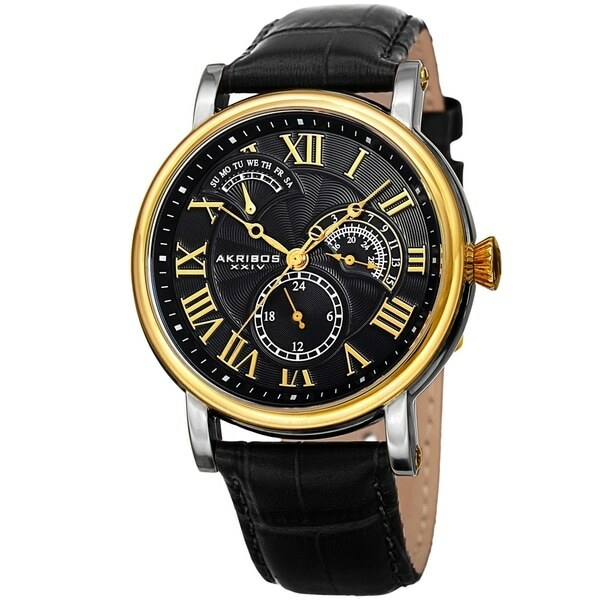 This is a very Good watch for the price at overstock its much higher on other site..the only negative for me was the band size they run 22inch my wrist is bigger so I would have liked a choice to order larger size maybe 24 inch. I bought one for my husband, he loved the gift. He use every day it’s very comfortable , excellent quality, resistant and beautiful. Excellent product I’m recommend. Real nice watch.A great upgrade from my worn out Seiko and Citizen watches.No luminescent indicators but very satisfied. I purchased this watch and am really happy I did.It looks very classy,and it keeps accurate time.I've gotten many compliments on it. Its a nice brand watch and like how it look.